Part 1 of the Baltics series (May 2015). It is said that a true Lithuanian is born from a zeppelin (cepelinas) — a delicious and hearty gnocchi-like dumpling stuffed with ground meat or mushroom. While that fact alone is enough to endear me to a whole nation (and their cuisine), the rest of my time spent in Lithuania did not disappoint either. Unlike most of my spontaneous trips, I’d always dreamed of visiting the Baltics. 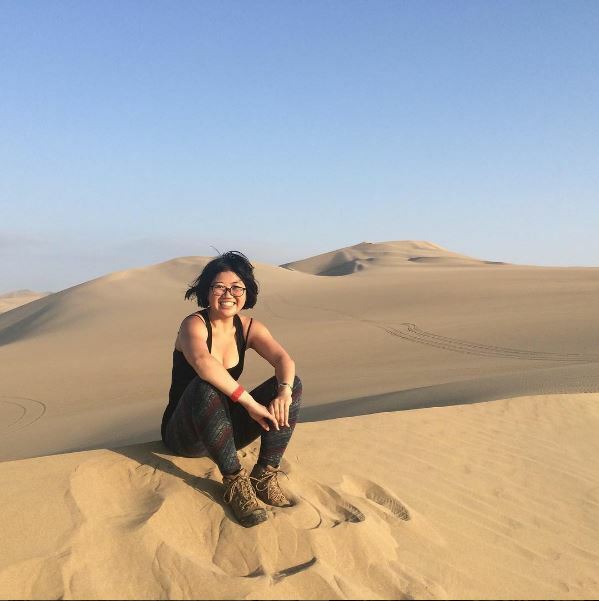 I’d been fascinated with the region since my days of being a history-obsessed teenager, and jumped at the first opportunity to take a few weeks off from revising to visit. I arrived in Vilnius, the capital of Lithuania, exhausted from a 6 a.m. flight but was determined to take in as much of the city as I could before meeting up with my couchsurfing host late in the evening. 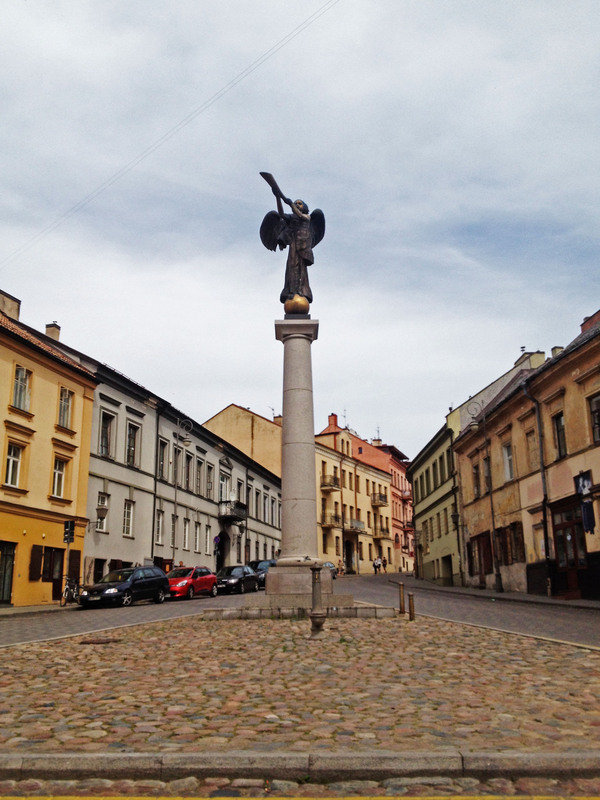 Vilnius is filled with quirks (including two cat cafes) and the Republic of Užupis is a must-visit. 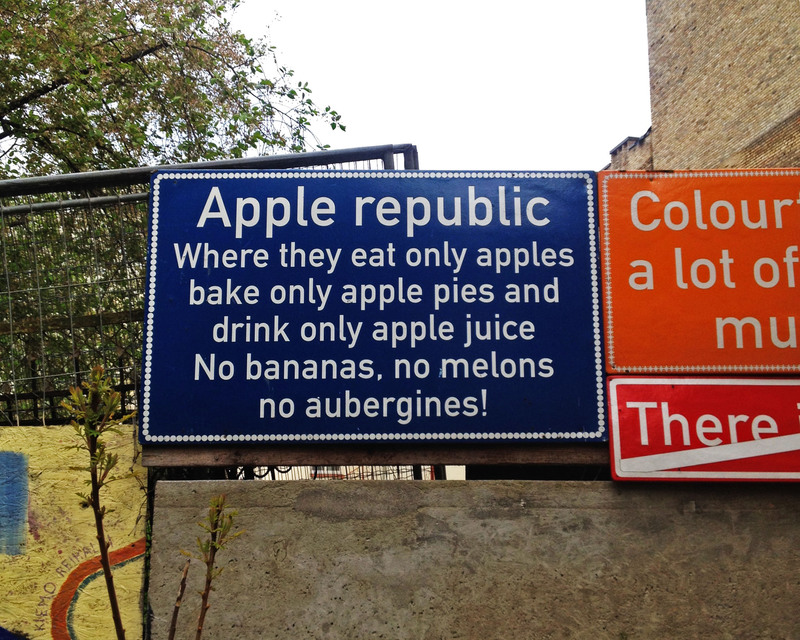 This sign greets you upon arrival in Užupis. 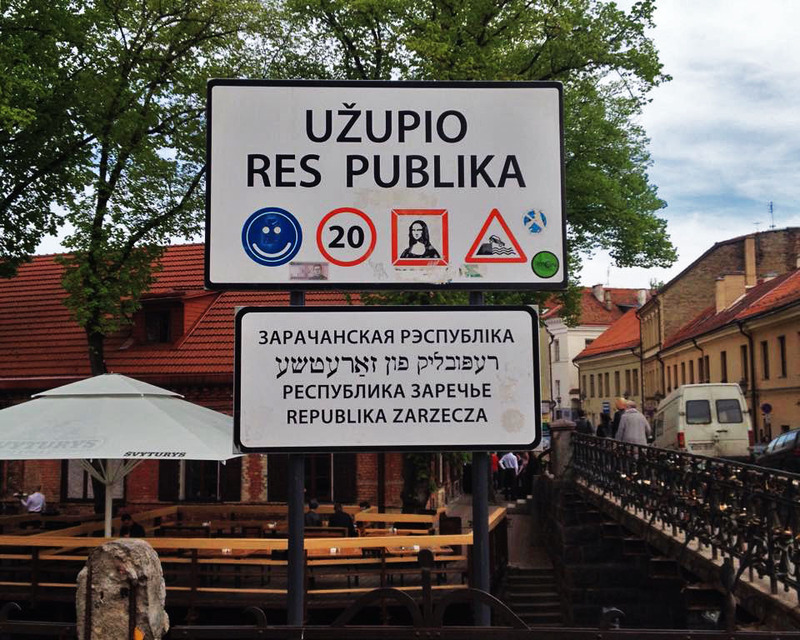 In 1997, the bohemian district of Užupis declared itself an independent republic, complete with a rather cheeky constitution (“Everyone has the right to look after the dog until one of them dies. A dog has the right to be a dog.”), passport stamp (which I unfortunately failed to obtain), president (currently Jaap van Ark), and independence day (April 1, obviously). One of the many art installations in Užupis. There’s no shortage of the creative, subversive, and delightful to explore in Užupis. The streets are lined with art installations and street art, and each alley holds new feasts for the eyes. In sharp contrast to the whimsy of Užupis is the Museum of Genocide Victims, housed in the former KGB headquarters. Out of respect, I did not take any photographs; instead, taking the time to immerse myself in the macabre history that transpired in that very building just over 25 years ago. The Cold War was anything but cold for Lithuanians living in the Lithuanian Soviet Socialist Republic, a Soviet puppet state swiftly established in 1940. A rich history of resistance and struggle is documented in the form of bibles, journals, and other items of cultural value which political prisoners not only refused to give up, but continued to create out of sparse resources while imprisoned. As I ventured further into the basement of the building, there was something incredibly chilling about seeing the cells where political prisoners were incarcerated and tortured, and being thankful that I would never be able to truly comprehend what it meant to live in fear daily of brutal repercussions for real or perceived opposition to the state apparatus. History has a way of colliding with the present. The day I arrived in Lithuania, the country had just reinstated military conscription (to much controversy) for men 19-28, over concerns of Russian military escalation in the Baltics. I left the Museum of Genocide Victims with a heavy heart, but also a deep, renewed sense of gratitude for the peace that we so easily take for granted. 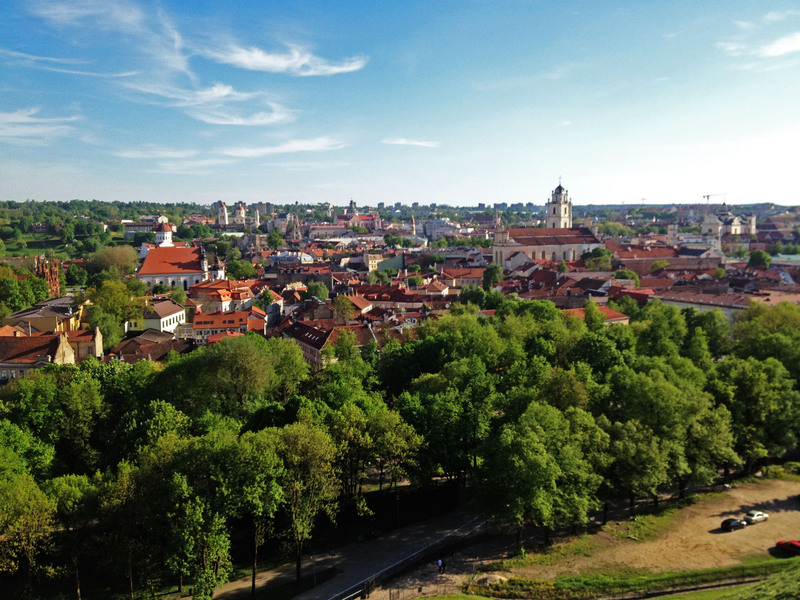 It is definitely possible to see Vilnius on a minimal budget. Aside from the cost of food, I didn’t really spend very much at all. The city is reasonably walkable, and I couchsurfed with some fantastic folks — one of whom, I later found out, went to university in Canada (Brock University), and another one who’s just moved to Vancouver. I decided not to purchase the Vilnius City Card as I knew I wouldn’t get my money’s worth. However, if you’re into museums, this is an excellent deal with unlimited museum access (17€ for a 24 hour card with public transit, and €26 for a 72 hour card with public transit). Next Next post: Who Killed Laura Palmer? Hi. I’m glad that you liked my country. It’s very eautiful, and the best time is our golden autumn, when it’s autumn but still sunny and all the trees turn red and golden. I hope you come back to explore Lithuania again.